Ties between the People’s Republic of China and the Russian Federation currently are rather friendly, especially if compared to the conflict-ridden years during the Cold War (Fu Ying, 2016). The first step to better relations was laid down in 1989 when Mikhail Gorbachev paid an official visit to China, marking the normalization of their relations. The relationship subsequently improved, leading to a „strategic partnership“ announced by Yeltsin in 1996 (Mankoff, 2009, p.201) and increased economic cooperation. Such close and warm ties between two big countries sharing a border are somewhat unusual. However, the relationship so far has been stable, even if China is not unconditionally backing all of Russia’s foreign policy decisions, and vice versa. 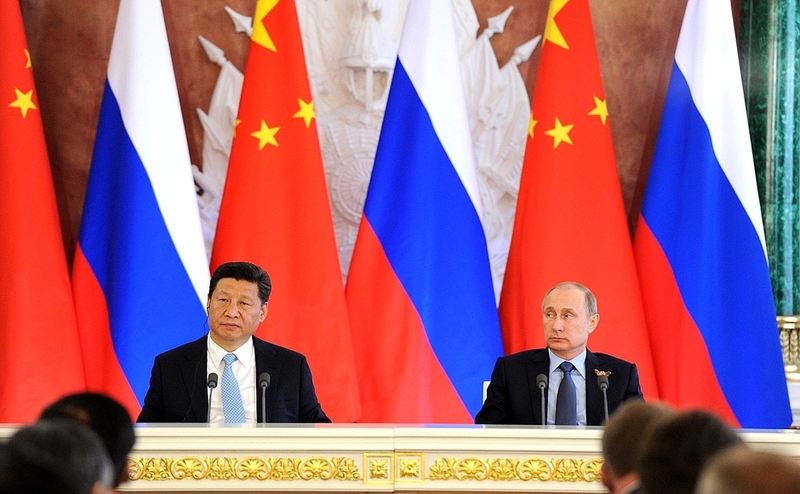 Russia for example has long taken a reserved stance on China’s „One-Belt One-Road“ initiative (Alexander Gabuev, August 6, 2015). Meanwhile, China is not backing Russia’s Ukraine policy, calling all sides to resolve the crisis politically, diplomatically and in accordance with international law (Edwina Gibbs and Michael Perry, March 9, 2014). These two cases exemplify the limits to the Chinese-Russian partnership and highlight the pragmatic logic underlying their relationship. China-Russia relations have improved as a result of overlapping security interests, having similar concepts in regard to a 21st century world order and because of an economic situation where China and Russia are complementing each other. Another reason why the relationship between those two states has been stable over the last years is due to the fact that China is currently preoccupied with complex challenges in the South China Sea and lacks the capabilities to truly project power on a global scale. 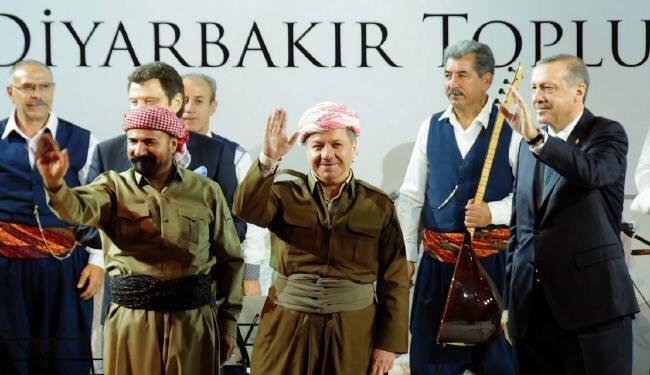 This reduces the amount of potential areas of conflict between the two countries. However, the situation could change over time, with China’s economic growth and steady expansion of its military capacities, Russia’s power might decline compared to China, while a stronger China could have the capabilities to take a more assertive stance in the region. Therefore, this article will try to assess how the relative growth of Chinese power will affect the relationship between China and Russia and will develop a series of scenarios assessing the potential for deteriorating relations. I will argue that the shifts in balance of power in the region, triggered by the economic rise of China, will produce scenarios where the situation between these two countries will be prone to rivalry and conflict. The shift in the balance of power in Asia in favour of China is important for the relationship between China and Russia in three regards. 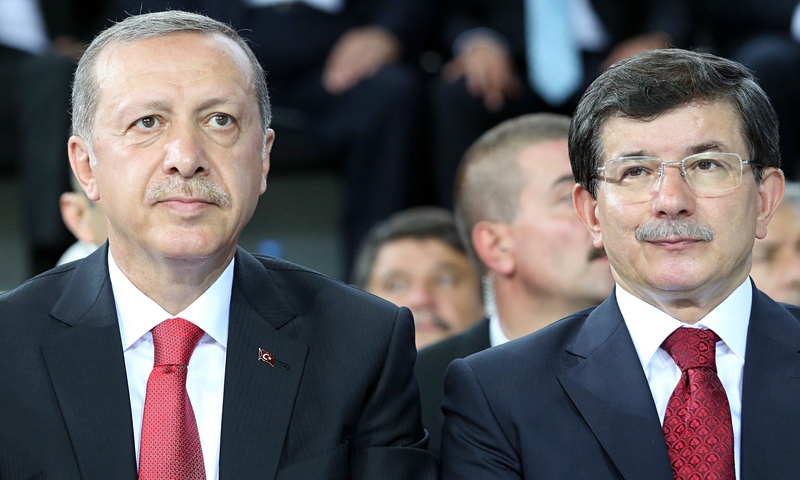 First, relations between two major powers sharing a common border are often prone to conflict. China and Russia themselves are a good example, with various conflicts and failed attempts to enter into an alliance during the 19th and 20th centuries (Fu Ying, 2016, p.97). Second, Walt’s „balance of threat“ theory argues that states balance against the biggest threat (Walt, 1987). States, according to Walt, evaluate the level of threat another state poses through four criteria: latent power, geographic proximity, offensive capabilities and perceived offensive intentions. As China already meets three of the four conditions, its latent power, huge population and economic performance, give it an advantage over Russia which is experiencing demographic and economic problems. Geographic proximity, as mentioned above, is also given, since the two countries share a 4200 kilometre long border. 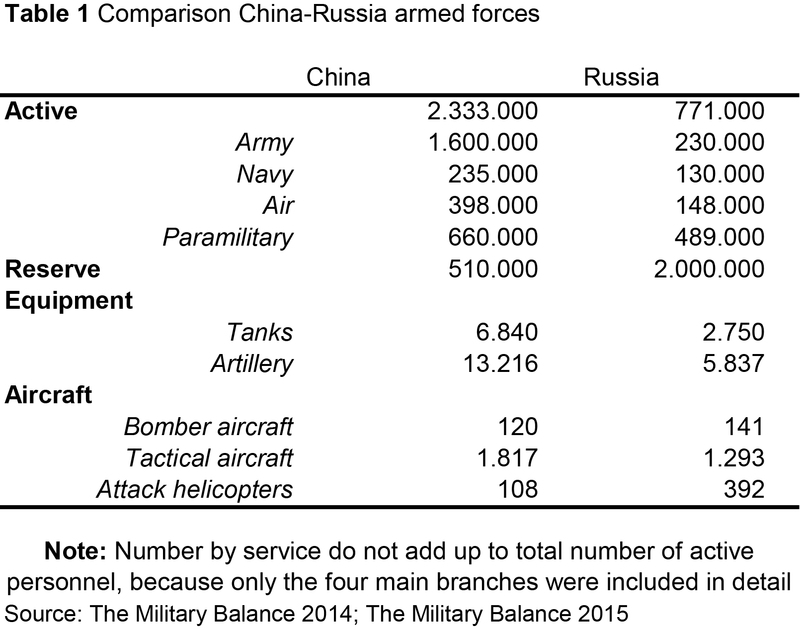 Regarding offensive capabilities, the Chinese defence budget is far higher than the Russian one. In addition China is modernizing its military on a very fast pace. Concerning offensive intentions, at the moment the relationship is stable and Russian views of China are mostly favourable (Bruce Stokes, August 5, 2015). Nonetheless, this could change over time and there are some possible scenarios which could trigger a shift in Russian perception. The specific scenarios will be discussed later in this article. Finally, both states are not entirely content with their status in the international system. As a result of its growing power China wants increased influence in the international order. Russia on the other hand wants to be a great power again and feels left out and marginalized by the United States and other western powers (Mankoff, 2009, p.16). While China’s economic growth provides it with the legitimacy to become a greater stakeholder in international affairs which cannot be overlooked by other states, Russia’s poor economic performance offers a bad starting point for a renewed ascendancy to great power status. Nevertheless Russia is willing to go to great lengths when its core interests are at stake. Therefore, it is questionable whether Russia will be willing to cooperate with China in the future, taking the part of „junior partner“. capabilities are also important to maintain modern and ready military capabilities since defence budgets need continued funding to guarantee functioning military institutions. Demographic factors help to assess whether a country will be able to extract enough manpower from its population to fill the ranks of its military as well as if there are enough working age people to keep the country’s economy running. Military capabilities, on the other hand, focus on the raw power of a state: how much funding does the defence budget get, how many people are en-listed in the nation’s army, how many people are on reserve duty and what is the amount of military equipment. While it is true that the outcome of a military con-flict depends on far more factors, these indicators nevertheless help to assess and compare military power. When comparing the two countries’ economic performance over the last two and a half decades, the growing difference in economic capabilities becomes evident. China’s economy has managed to grow at an enormous pace and is now the single biggest market economy with a GDP over five times as large as the GDP of the Russian Federation. Figure 1.1 clearly shows this deepening gap in economic capabilities. 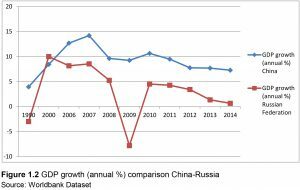 Even though Russia experienced high growth rates during Putin’s first presidential term, ranging between 10 and 5 percent, the Chinese economy still outpaced it (The World Bank, 2015). As Figure 1.2 shows the Chinese growth has slowed down in recent years reaching growth rates of 6 to 7 percent, com-pared to 14 percent in 2007. But since the Russian economy is struggling with the repercussions of the global financial crisis, the low oil prices and structural problems it does not seem as if Russia will be able to close this economic gap even a little bit in the years to come (The World Bank, 2015). Comparing China and Russia regarding demographics somehow seems obsolete, considering that China’s population is about 9 times bigger than the Russian one. Nevertheless, the demographic development of both countries holds important aspects for the relationship between the two states. While the Chinese population is constantly growing, even though at a slower pace than before, the Russian population has experienced decades of decline and has only just recently begun to increase again (Figure 2.1). The same trend can be seen regarding labor force as shown in Figure 2.2. Although a growing labor force can be problematic for employment rates, it nonetheless is a good indicator to assess the latent capabilities of a state. 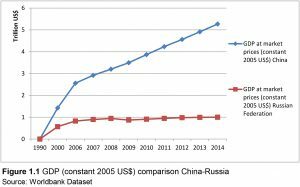 For both dimensions of latent capabilities, economic and demographic, we observe a widening gap between Russia and China. Therefore, it is important to assess if this shift in latent capabilities is translating into a shift in the balance of military capabilities. The most basic indicator to assess a country’s military capabilities is to look at its defence spending. The Chinese defence budget amounted to 129 billion US$ in 2014, compared to 116 billion US$ in 2013 (The Military Balance, 2015, p.237). In comparison the Russian defence budget amounted to 66 billion US$ in 2013 and increased to 70 billion US$ in 2014 (The Military Balance, 2015, p.184). It has to be noted that, while the budgets of both states are increasing very fast, the question remains if Russia will be able to keep this pace in the face of a struggling economy. Additionally, the Chinese budget does not include all military expenditures. The Military Balance (2015, p.237) argues that the real military expenditure of China actually amounted to 162 billion US$ in 2013. This difference in defence spending shows how much the gap between the two countries is growing not only in economic terms but also regarding military power. Both countries are deeply committed to maintain, enhance and adapt their military capabilities. 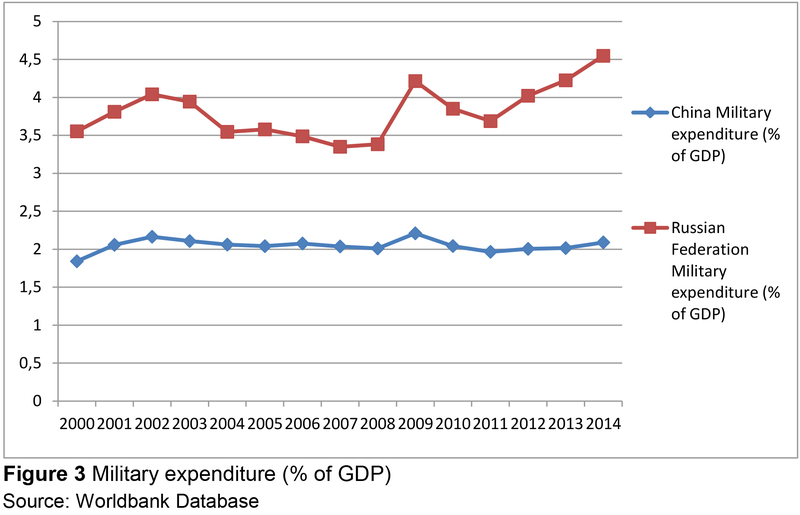 Figure 3 shows the military expenditure as a percentage of GDP and it reflects the Russian dedication to its armed forces even under economic pressure. 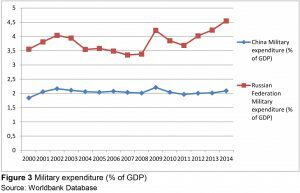 The Chinese military spending relative to GDP has been pretty much constant over the last decades, taking advantage of the economic growth to enhance its military capabilities without having to limit other parts of public spending. To get a more detailed account of the military capabilities of China and Russia one has to not only assess military spending but also take the state of the armed forces and its distribution into account. It is necessary to look at the personnel, its equipment and its allocation. This can help to understand the effectiveness and vigour of armed forces and makes it possible to compare the power of two states in more detail. But since these indicators cannot capture every component of an armed conflict, it must be noted that they serve rather as a tool to assess capabilities than to predict the outcome of a conflict. 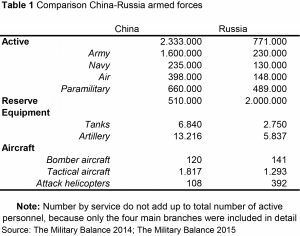 Table 1 compares the two armed forces, finding that the Chinese military outpaces the Russian one in every category except attack helicopters and bomber aircraft. While Table 1 does not include all types of equipment and not all branches of the military, it is still able to demonstrate China’s offensive capabilities. The reason some types of equipment have been left out of the analysis is twofold. First, China and Russia share a long border, making it likelier for a conflict to be fought on land rather than on sea. Therefore, focusing on infantry, tanks, artillery and air-craft seems acceptable. Second, Mearsheimer (2014, p.83) argues that land power is ultimately the dominant form of military power. The focus on land power in this analysis will become clearer in the next section of this article, where possible conflict scenarios will be introduced. Table 1 also clearly shows that China already has the offensive capabilities to threaten Russia. This section sought to address the different dimensions regarding the growing power gap between China and Russia. The gap is probably most pronounced regarding latent capabilities. Even though China’s economy is now growing at a slower pace, it is still outperforming most of its neighbours and is clearly on a better track than the Russian economy, which is still struggling because of the reasons mentioned above. This trend also applies when it comes to military capabilities. China is going to spend far more on its military than Russia in the years to come and even if the Russian economy recovered, Russia would still not be able to easily close this gap in military capabilities. This section also showed in more detail that China is close to fulfil the conditions set out by Walt (1987) for being perceived as a threat by Russia. Therefore, the next section is going to address the question under which circumstances a shift from partnership to rivalry in the Chinese-Russian relationship could occur. Confronting the three evils of separatism, terrorism and religious extremism (Mankoff, 2009, p.218), keeping the United States out of „spheres of interest“, preserving a stable Korea and the Non-proliferation of weapons of mass destruction (Bellacqua, 2010). Based on multipolarity and national sovereignty with the United Nations as the central conflict resolution organisation (Bellacqua, 2010, p.4f.). Alexander Gabuev (August 6, 2015), ‘Post-Soviet States Jostle For Role in One Belt One Road Initiative’, Carnegie Moscow Center . Bellacqua, J., ed. (2010), The Future of China-Russia Relations, Asia in the new mil-lennium, University Press of Kentucky. Mearsheimer, J. J. (2014), The tragedy of great power politics, The Norton series in world politics, updated edition edn, W.W. Norton & Company, New York. The Military Balance (2015), ‘Complex crises call for adaptable and durable capabilities’, The Military Balance 115(1), 5–8. The World Bank (2015), ‘World Development Indicators’. Walt, S. M. (1987), The origins of alliances, Cornell studies in security affairs, Cornell University Press, Ithaca.